I saw these guys at Warped Tour last year and thought they were a perfect fit. They’ve got a high energy live act and were adored by the throngs of screaming girls in the audience. While giving Blood in the Water a first listen, I browsed other review sites to see what was being said…sigh. I fully believe MC Lars when he tells us that “Hot Topic is not punk rock,” but there’s no need to slam the kids who like the music they promote, or the bands who capitalize on the sound. 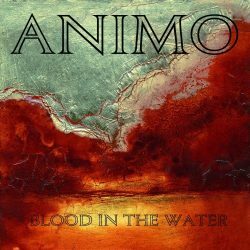 Animo perfectly capture the summer fest’s style, and Blood in the Water is a very decent, albeit short, album. While I agree with the general web consensus that these guys don’t fit the classic definition of punk, they’re poster children for pop-punk. Their songs are amazingly catchy, their lyrics don’t drag into the total emo-therapy downturn that lesser Warped acts have. They’ve got a brilliant drummer, great guitar hooks, slappy bass support, and amazing vocals. Radio pop-punk isn’t disrespectful to the pioneers of the 70’s, it’s a natural progression supported by America’s youth who are bound to adore Animo.